A comedic genius, no exaggeration. 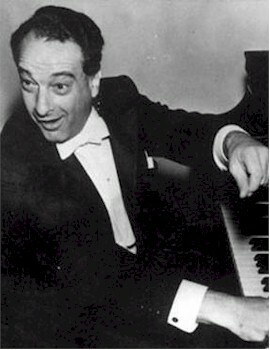 Victor Borge was so entertaining, truly the best at what he did. The link given above leads to a video no longer available, but just go to YouTube.com and search 'Victor Borge punctuation' and you'll find plenty of examples of his brilliance. Lots of laughs! Never got to see him live, but always enjoyed his artistic silliness. He was a master, to be sure. Saw him perform in a one-man show he called "Comedy in Music" in New York back in 1954, and never laughed so much in my life, before or since, at any other performance by anyone. Forty years later, I saw him at a shoe store in Stamford CT. The clerk asked him if he were interested "in a particular shoe", and Borge quickly replied that he was interested in "a PAIR of shoes, since as you can see, I have two feet."